IXP Peering Roadshow and Routing Technical Training held in Ouagadougou, Burkina Faso from 15 – 19 January 2019. The workshop had 25 participants from 18 organizations involved in the Internet ecosystem. Main outcome was agreement by the members transition to a layer 2 topology as per IXP best practices. MoU signed with the Africa IXP Association (Af-IX) in support of developing their institutional capacity needed to take leadership on the future of interconnection and traffic exchange in Africa. AF-IX has already engaged Rwanda-IXP (RINEX/RICTA) to host and provide the secretariat function. ISOC Congo Chapter: convened local stakeholders to discuss and plan the Congo national IGF. 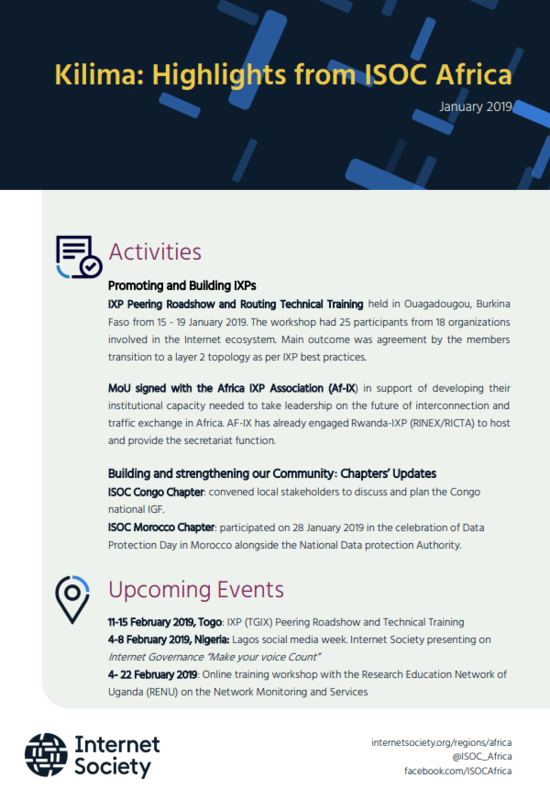 ISOC Morocco Chapter: participated on 28 January 2019 in the celebration of Data Protection Day in Morocco alongside the National Data protection Authority.